Our chino in a rugged, heavy canvas. It's just the right balance of toughness and refinement. 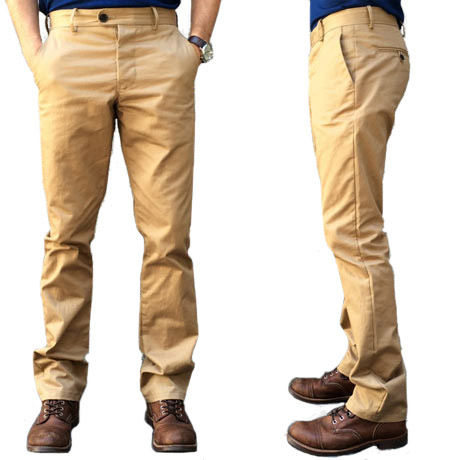 Gustin Chinos made from cotton duck canvas woven right in the USA. We launched our chinos in classic style, using traditional twills from the USA and Japan, but we've been itching to take the classic chino cut in many different directions. This style uses a beefy duck canvas. At 12oz, the pant has great body and feels substantial on. The plain canvas weave gives it a slightly more rugged, work wear look. The shade is sandy ecru that pairs well with lots of colors. We pre-wash the fabric to soften it up and to reduce shrink. This is a great alternative if you are looking for the traditional chino fit in a slightly tougher fabrication. By now, you know we’re obsessed with construction and our Chino is no exception. We approach this garment considering it to be a tailored pant. The waist band is fully curtained using a beautiful, slubby, indigo chambray fabric and a red center stitch. This produces a totally clean finished upper. We also clean finish the fly and seat seams with indigo chambray binding. The fly is secured with custom shaped and engraved Corozo buttons. Belt loops are hand folded, tucked on the bottom and top waistband for added strength. They are also made in a slightly narrower width as compared to our denim to give the pant a more refined look. Traditional slash pockets are on the front, bar tacked on top and bottom. The back pockets are intricately constructed welt pockets also secured with our custom Corozo buttons. Both inseam and outseam use a busted seam for less bulk. This is construction done the right way throughout. We started from the ground up on fit to create both our slim and straight styles. As with our denim, we like a classic look but with an updated fit. Our slim sits lower on the waist and is well tailored through the thigh down to the cuff. It’s not extreme, but definitely a modern, tailored fit. Our straight is designed to sit a bit higher on the waist and is more relaxed in the thigh to the cuff. If you like our slim denim, go with the slim khaki. If you like our straight denim, go with our straight khaki. This is the same style and quality that was sold in boutiques all over the country for $205+. Choose either our Straight fit or Slim fit. More details available on our fit guide. Fit guide Click here for our fit guide. We started from the ground up on fit to create both our slim and straight styles. As with our denim, we like a classic look but with an updated fit. Our straight is designed to sit a bit higher on the waist and is more relaxed in the thigh to the cuff. Our slim sits lower on the waist and is well tailored through the thigh down to the cuff. It’s not extreme, but definitely a modern, tailored fit. With the waistband buttoned, lay out your pants flat, and pull the top of the front edge to the top of the back edge. Measure from one end of the waist to the other, and multiply this number by two. With the pants still buttoned and flat, measured from the crotch seam to the top edge of the front of the pant. With the pants still buttoned and flat, measure across the thigh, 2” down from the crotch seam. Multiply this number by two. 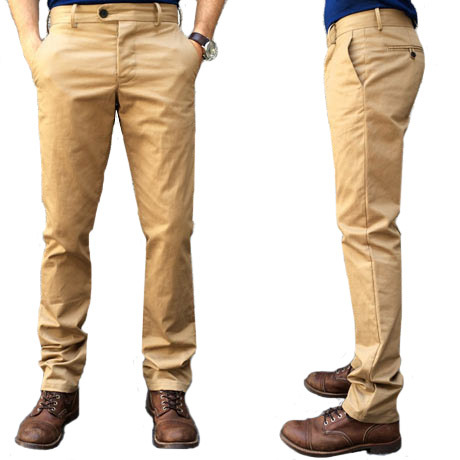 With the pants still buttoned and flat, measure across the knee, 15” down from the crotch seam. Multiply this number by two. With the cuff flat, measure the width and multiply by two.